Why They Dance is a book that records the experiences of 21 HK dance artists whose conviction, struggles, and perseverance have enabled them to realize their visions in dance. It provides a glimpse into some of the things that motivate the wonderfully diverse expressions of dance in HK through the words and works of the people engaged in this multifaceted art form. The book is a collection of articles about artistic directors Willy Tsao, Stephen Jefferies, Jiang Hua Xuan, Andy Wong, and Francis Leung; choreographers Helen Lai, Mui Cheuk-yin, Yuri Ng, Daniel Yeung, and Yeung Wai-mei; dancers Abby Chan, Yu Pik-yim, So Hon-wah, Wu Kwan, Selina Chau, and Dominic Wong; dance advocates and educators Pearl Chan Po Chu, Pun Siu Fai, Virginia Lo, Florence Lui, Andy Wong, and Ng Sze-wan; and cross media dance in HK. Total 315 Pages, including 30 pages of colour photos, hard cover, bilingual. 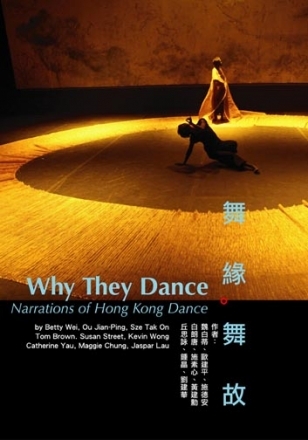 Accompanying the book is a 2-DVD set Hong Kong Dance Archives produced by Ringo Chan, Chang Lok-yee, and Fong Yuk-ping. Recording different aspects of Hong Kong dance in action, the DVD set contains four documentaries: Dance Companies? Independent Artists? Dance Education? and Overseas Exchange? with interviews and dance excerpts, including Daniel Yeung, Metalove, Zero Zero Ensemble, Visable Melody, Yeung Wai-mei, Spiritual Girl, Mui Cheuk-yin, Lot.us, and Ong Yong Lock 10 Nights.